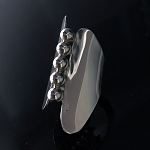 Modern Classic Jewelry - This is a handcrafted medium width sterling silver "every day" slip-on cuff bracelet that is hand-formed from 18 gauge sterling silver and has a narrow reverse beveled rim on the edges to add dimension. 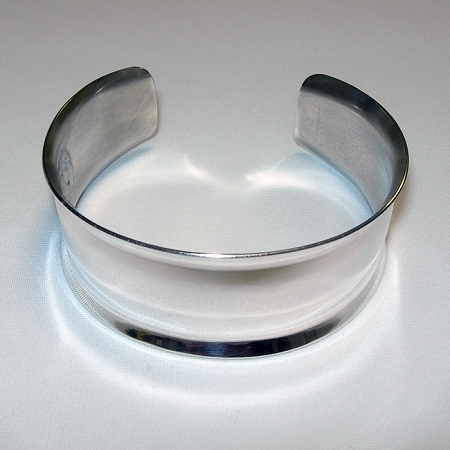 This is a medium width classic Sterling Silver cuff bracelet.The high polished silver is fabricated from 18 gauge sterling silver and has a narrow reverse beveled rim on the top and bottom for added interest.This bracelet is a nice complement to our silver jewelry collection. This cuff bracelet can be worn with the opening in the front or the back and is designed to fit somewhat snug on the wrist or arm to avoid the bracelet from turning. This is a piece is designed, handcrafted, and signed by Aaron Rubinstein and Modern Art Jewelry. This Bracelet is approximately 1.2" wide.